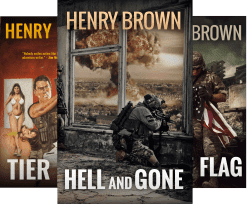 Book Horde: Hell and Gone by Henry Brown - 99c Sale & Extended Excerpt! This is a great time to grab Hell and Gone, the first book in Hank Brown's Retreads series, as it is only 99c for the next few days! Major Hasan saw the shape of Bor appear on the horizon, had his driver veer slightly eastward, then signaled his convoy to fan out. They spread from the road into the fire-ravaged sorghum fields and clay patches spotted with elephant grass. Hasan had managed to muster some 120 of the troops under his command. An attacker should outnumber the defender at least three-to-one, if the defender was dug in. These defenders weren't dug in, and Hasan always used overkill when he could. He felt good about the pending operation. At first only about thirty men answered his alert, which was close to all he needed, technically. But as daylight broke, word spread rapidly among the villages in his jurisdiction. Many men recognized the historic potential of Hasan's battle to extinguish the Christian resistance, and wanted to be involved. The radio came to life. The armored car on the left flank reported an unidentified vehicle moving parallel with Hasan's formation. "Looks like a civilian truck," the gunner said. Hasan stood up in the gunjeep's passenger seat and looked over his column, to see if it was someone who'd fallen out of formation. The halftrack rolled along directly in front of his gunjeep, wheeled APCs (Armored Personnel Carriers) on both flanks and cattletrucks trailing behind. Everyone just where they were supposed to be. Hasan didn't see the civilian vehicle, but he saw the dust geyser it kicked up. Siyr and the Mossad agent both braced for the fire that could come at any second from the armed vehicles. The agent sped the Jeep as fast as he dared over the rough terrain, chewing on his lip wordlessly. On their way back to the location of Siyr's dugout canoe, a fan belt had slipped off the alternator pulley. Thankfully it didn't break. But the engine had begun overheating and the alternator, of course, quit charging. By the light of a small flashlight, they attempted to loosen the alternator brackets enough to slip the belt back on, but this proved far more difficult than it had any right to be, and a crucial bolt was lost. When they found the bolt, dawn was breaking. By the time the belt was back in place and the alternator tightened down, there was no chance of slipping Siyr back into the village undetected. They forgot about the canoe and drove straight for the village. They overtook the PDF column just a few klicks from Bor. Bor loomed closer ahead on the right. The Dinka village was only twenty minutes away. The unknown vehicle sped forward, passing Hasan's formation. Hasan's convoy rolled along at 60 KPH, about the fastest the cattletrucks could move over the rough terrain. The unknown vehicle was doing at least ninety, probably more. If he could see it, then its driver could definitely see his formation. Most civilians ran in the opposite direction when they saw the Popular Defense Forces on the move. This one seemed to be trying to beat him to the village. Is he racing to warn the enemy? Hasan raised the radio microphone to his mouth. He was about to order the armored car to take out the civilian vehicle, but he hesitated. Sound carried fast and far across the plains, and they were close enough to the village that opening fire now would jeopardize the element of surprise. The sound would warn the rebels faster than the civilian vehicle could. "Let him go," Hasan said. "Maintain present course and speed. From the church, Cavarra heard the heavy thudding of the machinegun on the range. Then the blooping of his grenadiers practicing with the M203s, using smoke shells. Cavarra, reclining on a pew with notebook out, shook his head upon noticing the latter. He wasn't sure whether to laugh or curse. There was a commotion outside, then someone burst into the church. He swung something down toward the floor and released it to go sliding across the church, as if bowling. It was a case of German beer. He looked around frantically for the pile of his gear. Cavarra put away his notebook. "Where the hell have you been?" "No time...!" panted the African merc. "Village...under attack...halftrack...armored cars...heavy weapons...coming from the north..."
"Slow down, man," DeChalk said. "What'd he say?" Cavarra heard what he'd said. But was it for real? "At ease!" Lombardi cried. "Listen!" They all listened. Cole shouted something from the rooftop. Cavarra and Lombardi rose with rifles in hand. Cavarra, Lombardi, Terrell and DeChalk poured out of the church and looked up. Cole stared down at Cavarra, eyes bulging out of his bulldog face. "You expectin' company, suh?" Inside, Campbell hastily donned his web gear, grabbed his M21 and loaded a round in the chamber. He removed the magazine, dug a .308 round out of his pocket and topped off the twenty-round box before locking it back into the rifle. He looked for his bush hat, found it, and slapped it on his head. Siyr finished strapping on his own gear, grabbed the rifle nearest him and looked around for ammo. He saw a stack of loaded magazines and stuffed them into his mag pouches. Outside, Cavarra yelled up at Cole, "What is it?" "Light armor," Cole said. "I see four...five vehicles...maybe more. Comin' straight at us!" "How long before they're here?" Cavarra asked. The sound of automatic weapons fire answered him. When finished at the range, every weapon was locked and cleared and Pappadakis did a quick safety check. Then they saddled up and headed back for the village in a grabasstic gaggle. There was some smoking and joking, but not as much as there might have been among men who knew each other better. When Scarred Wolf stopped in his tracks, the others froze, following the line of his eyes with their own, as if some unseen orchestra had begun playing suspenseful music, signaling imminent danger. Heading toward the village from the north was a fast-moving Jeep. "Is that Mugabe?" Asked Zeke. "It's that Limp-Richard from the CIA," Mai said. "Mugabe is the CIA guy," Fava-Vargas said. McCallum reached behind himself to wriggle a hand into his buttpack. He extracted a small pair of rubber-armored binoculars, held them up to his eyes and brought them to focus. "That's a green Jeep," he said. "Mugabe drives a black S.U.V. with waterboo horns." The Jeep slowed to walking speed just inside the village. A black man jumped out of the passenger door and hit the ground running toward the church. He was carrying...a case of beer...? The Jeep accelerated, blazing through the village, out the other side and off into the horizon. The view of the running man was obscured by the buildings of the village. Villagers, young and old, burst from their huts and ran for the river like lemmings in overdrive. Now Scarred Wolf pointed to a growing tsunami of dust on the horizon. "Now that can't be good," McCallum said. Mai whirled on him. "You best re-clear that rifle, marine," he said, with a few expletives thrown in for emphasis. "Nobody told you to lock-and-load." Actions slammed home in a metallic cacophony. It would have been a humiliating moment for Mai, but things were happening too fast for embarrassment. McCallum surged forward, range-walking for the village. Zeke did likewise, and the rest followed. Without a word being spoken, the men fell into a wedge formation, McCallum on point, five-to-ten meters between each man. Scarred Wolf set down the machinegun, slung the Galil around his back and called to Bojado, "Give me that ammo can." Bojado trotted over and dropped the heavy can. Scarred Wolf knelt, popped the lid open, pulled the first few links of the belt out and loaded the machinegun. Zeke, unaware of this activity behind him, pumped his fist up-and-down twice in the signal for "double-time." Maintaining the wedge formation, the men ran toward the village. "Want me to get the tripod?" Bojado offered. Scarred Wolf started to disconnect the tripod from the gun, then stopped and shook his head. The gun would be almost useless without it--which meant he and Bojado couldn't be separated. He'd never worked with Bojado and wasn't positive they could stay together in the impending action. Bojado shrugged and sprinted to catch up with the others. Major Hasan's column bore down hard on the village. His radio squawked. This time the call was from the halftrack. "Major, I see men with rifles at the edge of the village. They are running toward the church." "Pincers!" Hasan ordered. "You may fire at will." The heavy machinegun atop the halftrack opened up. The long burst demolished some villager's erstwhile home. At the first explosion of gunfire, McCallum dove to the ground. The others were only a split second behind him. "Hit the dirt!" Mai yelled. A mud-and-tin shanty at the edge of the village shook violently as large-bore MG bullets tore through it. The whole structure disintegrated in a shower of clods and dust. McCallum stuffed his binoculars inside his shirt and plucked a smoke grenade from his vest. He assessed the direction and speed of the breeze while working the pin loose. He let the spoon fly and tossed it a short distance away. Cavarra glanced around quickly. The best thing to do would be jump in the trucks and unass the area, but the gear wasn't loaded and his force was split. They'd have to fight it out. "Grab your trash!" Lombardi, DeChalk, Terrell and Cavarra ran inside the church. "Let's get outside!" Cavarra said, pulling on his web gear. They wouldn't suffer the same fate as the previous occupants of the church, if he could help it. DeChalk spun in circles, a panicked expression on his face. "Where's my ammo? I had nine loaded mags!" Cavarra glanced around. "There's ammo down below. While you're down there, grab some LAWs. And move with a purpose!" Cavarra followed Lombardi back outside. Terrell found his magazines, but his rifle was missing. He raced DeChalk down to the basement. Both men cursed inventively on the way. Campbell slung the M21 over his back and scurried up the ladder. As he hoisted himself atop the roof, Cole looked back toward him with a lost expression. "What's our orders?" Cole asked. "It's opfor," Campbell said. "Engage targets of opportunity...I guess." There was no shortage of targets. Cole turned back around and put his cheek to the stock, released the safety and centered his crosshairs on the driver of the cattletruck. He squeezed the trigger. The M21 bucked in his grip. The cattletruck windshield spiderwebbed around a small, neat puncture and the driver spasmed in his seat. The cattletruck creaked to a stop some hundred meters from the edge of the village. Campbell pulled the ladder up after him and laid it on the roof. Cole fired again and a front tire on the APC flattened. It swerved and almost hit the gunjeep. This threw off the aim of the gunner on the armored car's recoilless rifle (a mounted single-tube rocket launcher). His rocket missed the church and hit the building just beyond. The jeep gunner opened up toward the church. Campbell unslung his rifle and dove to a prone firing position a few meters from Cole. Cole fired again and the man at the recoilless rifle was twisted in his station as if struck by a wrecking ball. The gunjeep swung into the village, between a row of buildings. The gunner had placed Cole's rifle report and adjusted fire. Heavy slugs slammed into the church just below the roofline, gouging out chunks of the wall. Shards of brick pelted Campbell in his forward hand but he tried to ignore it as he tickled his trigger. 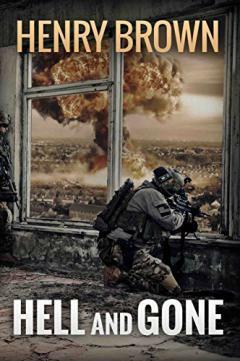 Find out what happens next in Hell and Gone on Amazon. And check out the rest of Henry Brown's books there as well. Many thanks for the plug! Book Horde rules!